A female patient, aged 55, was referred by a specialist oral and maxillofacial surgeon for examination and possible treatment of facial pain of endodontic nature. The patient, who spoke only Polish, was accompanied by her son-in-law, a Polish specialist general surgeon, who was able to communicate in English and to act as interpreter. The complicated, detailed, tragic history of the patient was related by her son-in-law. While travelling by car through Czechoslovakia in 1995, she was involved in a serious motorcar accident. Initially, bystanders considered her dead and she received no medical attention. After some time someone noticed that she was in fact alive. She had suffered severe facial, maxillary and ophthalmic injuries. Emergency treatment was administered and she was then hospitalised. She underwent several surgical procedures, including the reduction of a Le Fort fracture and the removal of her right eye. Eventually her wounds healed well enough for her to be discharged. She was still suffering pain in the facial region but it was not considered abnormal. After some time she returned to her doctor complaining of continued pain in the facial region. No definitive diagnosis was made. She returned several times with the same outcome. Usually she received a prescription for analgesics but these did not seem to have any real effect. She was then referred to several medical specialists for examination and treatment but without any success. She became depressed because her life had become a misery. Her only relief from pain was to go to sleep. Pain had become her constant companion and no one in Poland, her country of residence, seemed to be able to help her. At this stage, in 1999, she decided to visit her daughter, a medical doctor, and son-in-law referred to above, both of whom were working and living in Namibia. They referred her to the oral and maxillofacial surgeon who in turn referred her to the author. Examination of the soft tissues revealed the presence of a tender, poorly defined area in the mucosa of the upper right maxilla. No swelling or redness was visible. Periodontal tissues were characterised by mild marginal gingival inflammation without any deep pocketing. Clinical examination of the teeth confirmed the presence of several defective restorations, notably a cantilevered fixed partial denture constructed from an unknown non-precious metal consisting of an abutment on the 15 and a pontic to replace the 14. Also defective were two acrylic crowns on the maxillary centrals, resin restoration on teeth 16, 13, 12, 22, 23, 44, 45 and 48. Another fixed partial denture in the upper left quadrant was found to leak on both abutments. The 47 was restored with a metal crown. Thermal and electrical pulp testing failed to deliver any significant findings. The interpretation of these tests was severely hampered by the language barrier as well as by the patient’s desperate emotional condition. Teeth 17, 15, 13 and 12 were moderately tender to percussion. Radiographic examination (Fig. 1) revealed the presence of 9 completely endodontically treated teeth, large restorations in close approximation to the dental pulps of several teeth and a periapical area associated with tooth 22. Fig.1 Radiographical examination revealed the presence of 9 completely endodontically treated teeth, large restorations in close approximation to the dental pulps of several teeth and a periapical area associated with tooth 22.
her imminent return to Namibia and then to Poland, a diagnosis of irreversible pulpitis of 16, 15, 13, 12 and 22 and periapical periodontitis of 18, 11, 21, 24, 44, 45, 47 and 48 was made. A treatment plan of 13 root canal treatments was presented to the patient who accepted it readily. She was informed in detail of the possible risks and complications of the proposed treatment and of the fact that it was impossible to guarantee that the treatment would relieve her from all facial pain. Over a period of 3 days the canals of teeth 17, 15, 13, 12, 11, 21, 22, 24, 44, 45 and 47 were accessed with Orifice Shapers, shaped using a step-down technique with manual K-flex files and rotary GT files and cleaned by means of ultrasonic irrigation with a new irrigation solution, electrochemically activated water (STEDS TM). Calcium hydroxide powder was mixed with STEDS and placed as intracanal medicament and the access cavities sealed with a reinforced intermediate zinc oxide eugenol material. In the case of the 21 it had been necessary to destroy the crown in order to gain access to the root canal and a temporary crown was fabricated. It was also attempted to instrument the root canals of the 18 and 48 but this proved impossible. At this point the patient was dismissed and she returned to Namibia. Over the course of the next few days regular contact was made with the son-in-law who reported a remarkable improvement in the patient’s condition. After a period of 7 days all pain had disappeared and for the first time in many years the patient expressed some interest in her surroundings and environment. She once again wanted to engage in normal everyday activities like shopping, watching television and walking, which for years she had had no inclination to do. Three weeks later the patient returned and all root canals were obturated using a combination of the single wave of condensation (System B) and the thermoplastic injection of gutta percha (Obtura 2). The patient was advised to have the 18 and 48 removed once she had returned to Poland. She was also advised about the leaking and defective restorations and to have them replaced at her convenience. At the time of writing, 5 months postoperatively, regular telephonic contact has confirmed that the patient has recuperated fully. The 18 and 48 have been removed and the long process of the restoration of her teeth and occlusion has begun. Facial pain can have many causes, some of which may be obscure in nature. By far the most common cause of facial pain is toothache. In the case of this patient the toothache had been shrouded for years, understandably, by the massive facial trauma she had suffered and also to some extent the surgery that she had undergone. For years the true diagnosis had evaded the clinicians and it is only now, with the benefit of hindsight, that the eventual diagnosis of pulpo-periapical disease can be judged to have been correct. However, this case bears testimony to the fact that common diseases occur more commonly. In other words, when in doubt, contemplated the more obvious or common disease. This patient had undergone tremendous suffering for years, more than the actual facial pain, because of misdiagnosis. It is interesting to speculate on the pathogenesis of her pulpal and periapical condition but it will always present more questions than answers. How was it possible that so many teeth could be involved at one time? 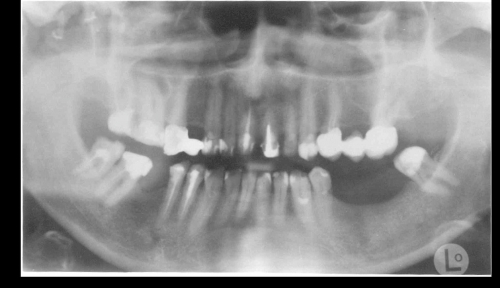 Why did not even one tooth develop a full-blown abscess? What was the exact histological nature of all the pulpal and periapical tissues involved? Was all the endodontic treatment really justified? There is no clear answer to all these questions. One thing is clear however: before our treatment the patient had several incompletely treated root canals: after these had been rectified, all the symptoms disappeared. It is perhaps fair to comment that in this case, incomplete root canal treatments had contributed to the general, vague condition of facial pain.